Here again: every newly announced show for the week! On page one you'll find a quick list of shows that particularly caught our attention, followed by embedded YouTube videos; there, you can check out some of the artists you may not be familiar with. Page two contains our complete listing of new shows, so you can do some digging of your own and let us know which ones you are excited about! Click through and start planning ahead. Action Bronson: Sun., Jan. 26, 7 p.m., $20-$24. Pop's Nightclub, 401 Monsanto Ave., East St. Louis, 618-274-6720. Chelsea Handler: Sat., April 12, 7 p.m., $49.50-$75. Scottrade Center, 1401 Clark Ave., St. Louis, 314-241-1888. Chromeo: W/ Oliver, Wed., May 7, 8 p.m., $25/$30. The Pageant, 6161 Delmar Blvd., St Louis, 314-726-6161. Fabolous: Fri., Jan. 10, 8 p.m., $25. The Coliseum Music Lounge, 2619 Washington Ave., St Louis, 314-531-2920. Heatsick: W/ Raglani, Black James, Thu., Feb. 13, 8:30 p.m., TBA. Kerr Foundation Building, 21 O'Fallon St., St. Louis, 314-436-3325. Magnolia Summer Album Release: W/ Grace Basement, Sat., Jan. 18, 8 p.m., $10. Off Broadway, 3509 Lemp Ave., St. Louis, 314-773-3363. One More Time: a tribute to Daft Punk: Sat., March 1, 8 p.m., $15. 2720 Cherokee Performing Arts Center, 2720 Cherokee St., St Louis, 314-276-2700. Roomrunner: W/ Multicult, Gnarwhal, Shaved Women, Sun., Feb. 23, 9 p.m., $6. CBGB, 3163 S. Grand Blvd., St. Louis, 314-773-9743. SLLAW: Woman's Arm Wrestling Match: W/ DinoFight!, Sat., Feb. 15, 9 p.m., $5-$10. Ye Ole Haunt, 1319 Saint Louis Ave., St. Louis, 314-588-7149. Syna So Pro CD Release: W/ DinoFight!, The Pat Sajak Assassins, Fri., Feb. 21, 9 p.m., free. Schlafly Tap Room, 2100 Locust St., St. Louis, 314-241-2337. 12th Planet: W/ Protohype, HeRobust, Antiserum, Steady, Tue., Feb. 11, 8 p.m., $15-$25. 2720 Cherokee Performing Arts Center, 2720 Cherokee St., St Louis, 314-276-2700. Aaron Kamm and the One Drops: Sat., Jan. 11, 10 p.m., $6. Broadway Oyster Bar, 736 S. Broadway, St. Louis, 314-621-8811. Action Bronson: Sun., Jan. 26, 7 p.m., $20-$24. Pop's Nightclub, 401 Monsanto Ave., East St. Louis, 618-274-6720. Adartis: W/ Estevan, Sat., Jan. 11, 11 p.m., free. Mangia Italiano, 3145 S. Grand Blvd., St. Louis, 314-664-8585. Adrianna Marie and Her Groovecutters: Thu., Jan. 23, 6 p.m., free. Blues City Deli, 2438 McNair Ave., St. Louis, 314-773-8225. Beth Bombara: W/ Cassie Morgan, Chris Vallillo, Tom Irwin, Thu., Jan. 23, 7:30 p.m., $12/$15. Focal Point, 2720 Sutton Blvd., Saint Louis, 314-781-4200. 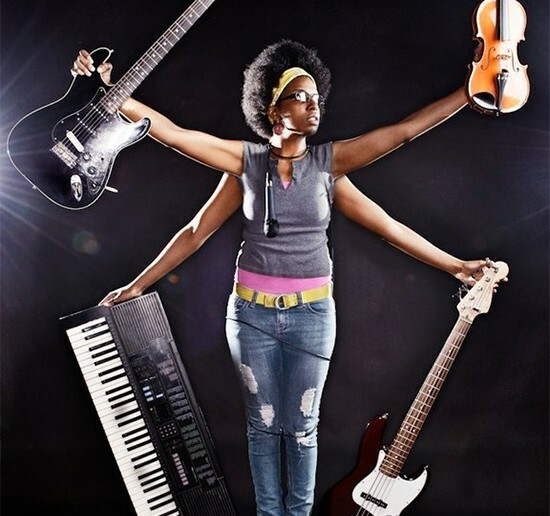 Black Actress: W/ Liquor Lord, Thu., March 6, 8 p.m., $8-$10. Fubar, 3108 Locust, St. Louis, 314-289-9050. Blind Willie & the Broadway Collective: Mon., Jan. 13, 8 p.m., $5. BB's Jazz, Blues & Soups, 700 S. Broadway, St. Louis, 314-436-5222. Blues Handle Band: Fri., Jan. 10, 9 p.m., $5. Hwy 61 Roadhouse and Kitchen, 34 S. Old Orchard Ave., Webster Groves, 314-968-0061. Cactus Smile: W/ Shooting with Annie, Jessi Kocher, Sat., Jan. 25, 9 p.m., $8. Blueberry Hill, 6504 Delmar Blvd., University City, 314-727-4444. Chad Becker: Sat., Jan. 11, 6:30 p.m., free. Sky Music Lounge, 930 Kehrs Mill Road, Ballwin, 636-527-6909. Chelsea Handler: Sat., April 12, 7 p.m., $49.50-$75. Scottrade Center, 1401 Clark Ave., St. Louis, 314-241-1888. Chromeo: W/ Oliver, Wed., May 7, 8 p.m., $25/$30. The Pageant, 6161 Delmar Blvd., St Louis, 314-726-6161. Crate 2 Crate Soundsystem: Sun., Jan. 12, 9:30 p.m., free. Broadway Oyster Bar, 736 S. Broadway, St. Louis, 314-621-8811. Dangers: W/ Perfect People, Blackhole, Lamentors, Fri., Feb. 14, 8 p.m., $8-$10. Fubar, 3108 Locust, St. Louis, 314-289-9050. Dave Black: W/ Dave Easley, Tue., Jan. 28, 7:30 p.m., free. Tavern of Fine Arts, 313 Belt Ave., St. Louis, 314-367-7549. Edgefield C. Johnston: W/ Daniel C. Roth, Sat., Jan. 11, 9 p.m., $5. Johnny's Sidebar, 109 E. Main St., Collinsville, 618-343-4409. The End of Soviet Music: Shostakovich and Beyond: W/ Silvian Iticovici, Richard Katz, Peter Schmelz, Tue., Jan. 14, 7:30 p.m., free. Washington University - Danforth University Center, 6475 Forsyth Blvd., University City. Fabolous: Fri., Jan. 10, 8 p.m., $25. The Coliseum Music Lounge, 2619 Washington Ave., St Louis, 314-531-2920. Featherstone Drive: Fri., Jan. 10, 6:30 p.m., free. Sky Music Lounge, 930 Kehrs Mill Road, Ballwin, 636-527-6909. The Fights: W/ The Manness Brothers, Mister Blackcat, Thu., Jan. 16, 8:30 p.m., $8-$10. The Firebird, 2706 Olive St., St. Louis, 314-535-0353. The Formerlys: Fri., March 7, 9 p.m., $5. Sky Music Lounge, 930 Kehrs Mill Road, Ballwin, 636-527-6909. Fred Walker: free. Ms. Piggies Smokehouse, 10612 Page Ave., Overland, 314-428-7776. Goodbye June: W/ CharFlies, Thu., Jan. 9, 9 p.m., $5. Foam Coffee & Beer, 3359 Jefferson Ave., St. Louis, 314-772-2100. Hailey Whitters: W/ Stephanie Lambring, Dana Anderson, Justin Brown, Wed., Jan. 15, 9 p.m., $5. Focal Point, 2720 Sutton Blvd., Saint Louis, 314-781-4200. Heatsick: W/ Raglani, Black James, Thu., Feb. 13, 8:30 p.m., TBA. Kerr Foundation Building, 21 O'Fallon St., St. Louis, 314-436-3325. Jake's Leg: Fri., Jan. 10, 10 p.m., $6. Broadway Oyster Bar, 736 S. Broadway, St. Louis, 314-621-8811. Jim Cady: W/ Kelly Quinn-Krener, Sun., Jan. 19, 10:30 a.m., free. Black Bear Bakery, 2639 Cherokee St., St. Louis, 314-771-2236. Jonezy: W/ Mvstermind, Con, Domino Effect, Tiffany Huber, Fri., Jan. 31, 9 p.m., $5. Blank Space, 2847 Cherokee St., St. Louis, 314-458-9472. Kevin Bilchik: Sun., Jan. 12, 2 p.m., free. Broadway Oyster Bar, 736 S. Broadway, St. Louis, 314-621-8811. Ladale Fitzpatrick Group: W/ Renee Smith, Sun., Jan. 12, 5 p.m., $10. BB's Jazz, Blues & Soups, 700 S. Broadway, St. Louis, 314-436-5222. Leroy Pierson: Fri., Jan. 10, 7 p.m., $5. BB's Jazz, Blues & Soups, 700 S. Broadway, St. Louis, 314-436-5222. Little Rachel and the Loot Rock Gang: Sat., Jan. 18, 1 p.m., free. Blues City Deli, 2438 McNair Ave., St. Louis, 314-773-8225. Love Life Women's Conference 2014: W/ Cece Winans, Israel Houghton, Fuzed Worship, Thu., Sept. 25, 7 p.m., $59-$69. Edward Jones Dome, 701 Convention Plaza St., St. Louis, 314-342-5201. Love Surrounds: W/ Ravenhill, Search Parties, Yankee Rain, Fri., Jan. 31, 9 p.m., $8-$10. The Firebird, 2706 Olive St., St. Louis, 314-535-0353. Magnolia Summer Album Release: W/ Grace Basement, Sat., Jan. 18, 8 p.m., $10. Off Broadway, 3509 Lemp Ave., St. Louis, 314-773-3363. Marquise Knox: Thu., Jan. 16, 6 p.m., free. Blues City Deli, 2438 McNair Ave., St. Louis, 314-773-8225. Miss Jubliee: W/ The Thin Dimes, Fri., Jan. 10, 9 p.m., $8. Blueberry Hill, 6504 Delmar Blvd., University City, 314-727-4444. The Mojo Roots Band: Fri., Jan. 10, 10 p.m., $5. BB's Jazz, Blues & Soups, 700 S. Broadway, St. Louis, 314-436-5222. North of the Quarter: Fri., Feb. 21, 10 p.m., $5. Broadway Oyster Bar, 736 S. Broadway, St. Louis, 314-621-8811. Old Time Assault: W/ Red Letter Days, Typhoon Jackson, Jordan Kylie, Thu., Feb. 20, 9 p.m., $8. The Crack Fox, 1114 Olive St., St. Louis, 314-621-6900. One Less Cheerleader: W/ The Bumble Bee Assassins, Edgefield C. Johnston, Fri., Jan. 10, 9 p.m., $5. Way Out Club, 2525 S. Jefferson Ave., St. Louis, 314-664-7638. One More Time: a tribute to Daft Punk: Sat., March 1, 8 p.m., $15. 2720 Cherokee Performing Arts Center, 2720 Cherokee St., St Louis, 314-276-2700. Paul Bonn and the Bluesmen: Thu., Jan. 9, 6 p.m., free. Blues City Deli, 2438 McNair Ave., St. Louis, 314-773-8225. Phil Westmoreland Group: W/ Erma Whiteside, Sun., Jan. 12, 8:30 p.m., $5. BB's Jazz, Blues & Soups, 700 S. Broadway, St. Louis, 314-436-5222. Pierce Crask: Sun., Jan. 12, 6 p.m., free. Broadway Oyster Bar, 736 S. Broadway, St. Louis, 314-621-8811. Pirate Signal: W/ The Lately, Living Room Lava, Homewreckers, Fri., Jan. 17, 9 p.m., $8. The Crack Fox, 1114 Olive St., St. Louis, 314-621-6900. The Please, Please Me: W/ Humdrum, Joeboy & Djibouti, Tim Rakel, Thu., Feb. 13, 9 p.m., $7. Plush, 3224 Locust St., St Louis, 314-535-2686. Project Xtreme: Fri., Jan. 10, 9 p.m., free. Heartbreakers Rock-n-Roll Saloon, 700 N. 2nd St., St Louis, 314-241-1720. Ras'Nit: Sun., Jan. 12, 11 p.m., free. Mangia Italiano, 3145 S. Grand Blvd., St. Louis, 314-664-8585. Red Green: Fri., May 2, 8 p.m., $45-$55. River City Casino & Hotel, 777 River City Casino Blvd., St Louis, 314-388-7777. Reds, Whites & Blues: W/ Miss Jubilee and the Humdingers, Sat., Jan. 18, 6 p.m., $45. Chandler Hill Vineyards, 596 Defiance Road, Defiance, 636-798-2675. Rich McDonough & Rough Grooves: Sat., Jan. 11, 10 p.m., free. BB's Jazz, Blues & Soups, 700 S. Broadway, St. Louis, 314-436-5222. Rio Debut: Fri., Jan. 10, 9 p.m., $5. Foam Coffee & Beer, 3359 Jefferson Ave., St. Louis, 314-772-2100. Roomrunner: W/ Multicult, Gnarwhal, Shaved Women, Sun., Feb. 23, 9 p.m., $6. CBGB, 3163 S. Grand Blvd., St. Louis, 314-773-9743. The Rum Drum Ramblers: Sat., Jan. 11, 1 p.m., free. Blues City Deli, 2438 McNair Ave., St. Louis, 314-773-8225. Shrinking Violets: Sat., Jan. 11, 9:30 p.m., $5. Sky Music Lounge, 930 Kehrs Mill Road, Ballwin, 636-527-6909. Skeletonwitch: Sat., Feb. 22, 9 p.m., $10-$14. The Firebird, 2706 Olive St., St. Louis, 314-535-0353. SLLAW: Woman's Arm Wrestling Match: W/ DinoFight!, Sat., Feb. 15, 9 p.m., $5-$10. Ye Ole Haunt, 1319 Saint Louis Ave., St. Louis, 314-588-7149. Slot Car Derby: W/ Letter to Memphis, Ador Glowing, Sat., Jan. 18, 11 p.m., free. Mangia Italiano, 3145 S. Grand Blvd., St. Louis, 314-664-8585. Soulard Blues Band: Sat., Jan. 25, 1 p.m., free. Blues City Deli, 2438 McNair Ave., St. Louis, 314-773-8225. The Spys: Sat., Jan. 11, 9 p.m., $5. Hwy 61 Roadhouse and Kitchen, 34 S. Old Orchard Ave., Webster Groves, 314-968-0061. Syna So Pro CD Release: W/ DinoFight!, The Pat Sajak Assassins, Tue., Jan. 21, 9 p.m., free. Schlafly Tap Room, 2100 Locust St., St. Louis, 314-241-2337. Teach Me Equals: Tue., Jan. 21, 8 p.m., free. Foam Coffee & Beer, 3359 Jefferson Ave., St. Louis, 314-772-2100. Terrapin Flyer: Thu., Jan. 16, 9 p.m., TBA. 2720 Cherokee Performing Arts Center, 2720 Cherokee St., St Louis, 314-276-2700. Three the Hard Way: Fri., Jan. 31, 10 p.m., $3. Llywelyn's Pub-St. Charles, 100 Main St., St. Charles, 636-724-6823. Thriftworks: W/ 18andCounting, Brooks Brown, Thu., Jan. 30, 8 p.m., $10. 2720 Cherokee Performing Arts Center, 2720 Cherokee St., St Louis, 314-276-2700. Tommy Halloran's Guerilla Swing: Sat., Jan. 25, 7 p.m., $5. Mad Art Gallery, 2727 S. 12th St., St. Louis, 314-771-8230. Troubadours of Divine Bliss: Thu., Feb. 6, 7:30 p.m., free. Tavern of Fine Arts, 313 Belt Ave., St. Louis, 314-367-7549. UNDERCURRENT: W/ The Funs, MUCK Trio, CaveofswordS, Dusty Fingers, Tim Rakel, Chris Ward, Thu., Feb. 27, 8 p.m., free. Schlafly Tap Room, 2100 Locust St., St. Louis, 314-241-2337. Valentine's Expressions of Love: W/ Neil Taylor, D'Fynitive Soul Band, Mookie Tolliver, Jai Suol, Avoran Graham, Belle Be, Dawn Weber, Cheron Brash, Mr. Rain, Sun., Feb. 9, 6 p.m., $15. The Sound Bar, 11836 W. Florissant Ave., Florissant. The Vince Varvel Trio: Tue., Feb. 11, 7:30 p.m., free. Tavern of Fine Arts, 313 Belt Ave., St. Louis, 314-367-7549. Vinyl Fight with Apop Records: Tue., Jan. 14, 11 p.m., free. Mangia Italiano, 3145 S. Grand Blvd., St. Louis, 314-664-8585. Vinyl Fight with Euclid Records: free. Mangia Italiano, 3145 S. Grand Blvd., St. Louis, 314-664-8585. Whiskey of the Damned: W/ The Ol One Two, Aristrocrat Laundromat, Wed., Jan. 22, 8:30 p.m., $10-$12. The Firebird, 2706 Olive St., St. Louis, 314-535-0353. The Whistle Pigs: W/ The Hooten Hallers, Thu., Feb. 13, 9 p.m., $7-$10. Off Broadway, 3509 Lemp Ave., St. Louis, 314-773-3363. The Wires: Sat., Jan. 25, 8 p.m., free. Tavern of Fine Arts, 313 Belt Ave., St. Louis, 314-367-7549.